The horticulture sector is spread across cultivation, propagation, processing and marketing of vegetables, fruits, nuts, ornamental plants, flowers, spices and turf. On the global map, India is one of the leading exporters of fruits & vegetables with an export of approximate INR 38.56 billion, comprising of INR 26.35 billion worth of fruits & INR 12.21 billion of vegetables. India accounts for about 10% of the 500 MMT of total global production of fruits (excluding melons) and in 2010-11, it produced 75.8 MMT of fruits and 137.7 MMT of vegetables. India accounts for about 15.5% of the 890 MMT of total global vegetable production. The nation is the largest producer of okra amongst vegetables & ranks second in production of potatoes (10%), onions, cauliflowers, brinjal, cabbages, etc. It is also the largest producer & consumer of cashew nuts and is the third largest producer of coconut and leads 90 coconut-producing countries of the world, producing 11 MMT (2010-11). India produces a wide variety of spices like black pepper, cardamom, ginger, garlic, turmeric, chilly and a large variety of tree and seed spices. The total production of spices was 4.0 MMT and the area covered was 2.5 million hectares. In regard to floriculture, the flower production in India is spread across 0.18 million hectares witnessed a production (2010-11) of 1 MMT of loose flowers and 69 million tones of cut flowers with USA, Germany, Netherland, United Kingdom and UAE as major importers. Vast supply of production base, increase in population and potential export market will remain the key drivers of the growth in this sector. 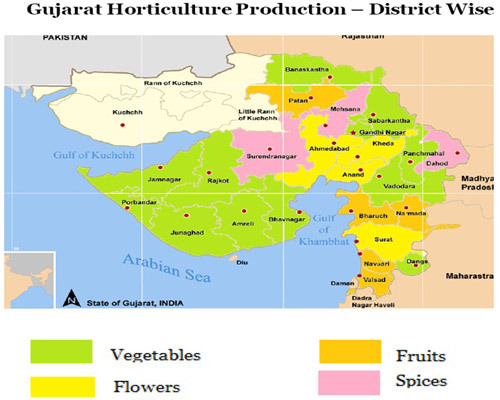 Gujarat has a strong contribution to the Indian horticulture sector. At all-India level, the State contributes from 14 percent to 20 percent share in major fruit and vegetable crops like; Papaya, Sapota, Onion, Banana and Lime. The state also enjoys leading position (1st rank to 4th rank) at all-India level in the productivity levels of major fruits and vegetables including onion, potato, banana, guava, tomato, lime, papaya, etc. The state being the world’s largest producer of cumin, also has the highest productivity in custard and guava production in India. In regard to horticulture, Gujarat has taken a lead in the sector of establishing Green House by producing high value flowers like Dutch Roses, Gerberas and Carnation. The production of flowers stood 1.3 lakh tonnes, over 15,000 hectares. Major flowers grown in the state are Roses Lily, Marigold, Jasmine, Tuberose. Flowers like Dutch Roses, Gerberas and Carnation are being grown. GLPC is involved in promotion of livelihood in the horticulture sector by providing technical and financial assistance to the beneficiaries through various Central and State level schemes. GLPC has assisted around 8,000 beneficiaries in the horticulture sector including closed cultivation, vermi compost units, honey production, crop diversification and floriculture. GLPC initiated the activity of production of compost manure through women SHGs in Sabarkantha district. Around 500 SHG members were identified and were organised for taking up this activity in a commercial way. GLPC provided technical as well as financial assistance to the beneficiaries. Through this activity, around 339 tonnes of compost manure is been produced with a turnover of around INR 67 lakhs and an income of INR 13,400 per SHG member on an annual basis. Sources : APEDA, Department of Agriculture and Cooperation, GoI; Socio Economic Review 2011-12 of Gujarat; Department of Horticulture, Gujarat; Agriculture and Cooperation Department, Gujarat.